Video games have been compared to “kiddie crack;” online messaging has been blamed for increasing the reach of childhood bullies; and youth internet addiction has been identified as one of the primary culprits behind the epidemic of childhood obesity. So any good parent should chuck the computer out with the evening’s trash, place a non-negotiable ban on any online activities, and start searching the attic for that old Monopoly set, right? The secret to ensuring that your children have a healthy relationship with the internet and video games (and, yes, there is such a thing as a healthy relationship with the internet and video games) doesn’t involve outright prohibition. Rather, it means effectively managing where, what and when your children play. In other words, if you can help your children learn to game and navigate the online world responsibly, you’ll have gained an essential point of entry into their lives. Attempt to assert a heavy-handed prohibition on the virtually ubiquitous devices, and you’ll forfeit any opportunity to influence their behavior. Easier said than done? Depending on the unique dynamics of your family, maybe so, maybe not. But read on to find out how you can transform your tech-obsessed offspring into healthy, well-rounded (and contributing) members of your family. If you’re like the majority of today’s parents, your childhood was probably spent substantially less immersed in technology. This means that when it comes to youth and technology, you’re going to be playing a perpetual game of catch-up — so you’d better get started. If you haven’t already done so, create an Instagram account, create a Facebook profile, spend some time watching videos on YouTube and play a few games online. Depending upon your relationship with computers, this may sound like a waste of time or even an intimidating proposition. But the more familiar you are with the online world, the better you’ll be able to understand what your children should (and shouldn’t) be doing there. Many of the large social media platforms offer parental controls, as do some digital game distribution platforms like Steam. Your online experiences will provide you with a number of insights, but you need to enhance your understanding of the dangers and benefits of internet use by young people. Read the research, talk to friends and consult with experts. Regardless of your level of expertise, there’s always more to learn. The internet is a dynamic, ever-changing environment, and you need to stay active in order to remain up-to-date about the important issues facing your children. Your kids won’t have any idea what your expectations are unless you communicate with them — and in the case of parent-child communication, it’s always wise to err on the side of too much talking. Even if your children are too young to be interested in the internet, you can still start the conversation by talking about following rules and staying within limits. And if they’re already online experts, talk about what they like and don’t like about being on the internet. Screens can be extremely compelling and children can’t be expected to monitor and limit their time around them. It’s up to you to observe their behavior and set reasonable limits in accordance with your situation. For communication to be effective, it has to be a two-way exchange of information. And for you to be in the best position to monitor what your children are doing, enjoying, worrying about or otherwise contemplating, you need to establish an environment in which they feel comfortable opening up to you. When it comes to curtailing excessive online activity or steering your children in a healthier direction in their browsing, communication isn’t about having a formal talk — it’s about starting a discussion before there’s a problem and continuing to listen, listen, listen. Ensure that their online activities take place where you can see what’s going on, such as a desk in the living room. Don’t let your children spend time on the internet behind closed doors. Set daily limits on acceptable amounts of screen time — and make sure that these limits aren’t exceeded. Take the TVs and video game consoles out of your children’s rooms. As with internet use, limit your children’s gaming to times and places that you can observe. Know your children’s screen names and passwords. If they are active on social networking sites like Instagram or Facebook, check their accounts. Learn how to check the computer’s browsing history to confirm what your children have been doing on the internet. Many cases of internet overuse can be curtailed by setting rules and remaining vigilant. But for some young people, using the internet or playing video games becomes a compulsion that they are unable to resist. 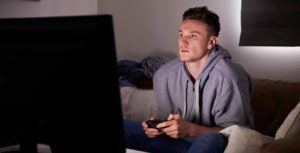 If your child is showing signs of internet addiction or compulsive video gaming, this behavior may be beyond your ability to influence — but professional help can provide the answers you’re looking for. Depending upon the nature of your child’s computer compulsions, treatment options can range from limited outpatient therapy to a more intensive intervention in a residential boarding school or teen wilderness program. At first, these options may sound like drastic measures for what looks like just “typical teen misbehavior.” But as mental health experts gain greater insights into the nature of compulsive and obsessive behaviors — and as awareness increases about the dangers and damages associated with internet addiction — the potential severity of the situation becomes clear. If you are concerned about your child’s video game use or internet activities, talk to a school counselor, consult with your family physician or contact a mental health services organization. Help is available, and a return to a healthy, moderate level of internet use is definitely within reach — but nothing can happen until you take that first important step.